I come to you bearing the third installment of the Elseworld's three-night crossover. The third part, Supergirl Season 4 Episode 9, was the darkest installment in Elseworld's, but for a reason -- it was the one where Deegan's "bigger" plan came to fruition. 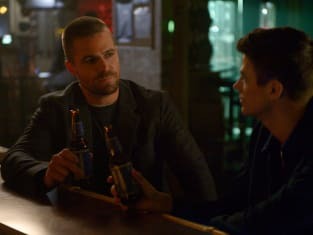 The previous episodes, mainly The Flash Season 5 Episode 9, set the scene for what was to come while focusing more on the lighter tone from the overly debated Freaky Friday/Quantum Leap body swap between Oliver and Barry. As my co-reviewer put it, it was pure amusement. Arrow's installment felt a little more disjointed as the episode tried to accomplish too much by introducing not only the famed Gotham City but also the city's backstory and its major player, Kate Kane aka Batwoman. However, Supergirl's final part was the time to make it or break it. Everything was at stake as Deegan, now the dark Superman, altered reality once again, this time, even more drastically. Deegan figured out two fundamental pieces that make up our superheroes -- their powers and their support team -- and proceeded to yank it from them. With their powers dampened and no alliances to lend a hand, they had to rely solely upon their own wits and skills. The Monitor put them to a test to see if they were "good enough" to defeat Deegan, a man who was allowed to put into existence any reality his deranged brain could drum up. 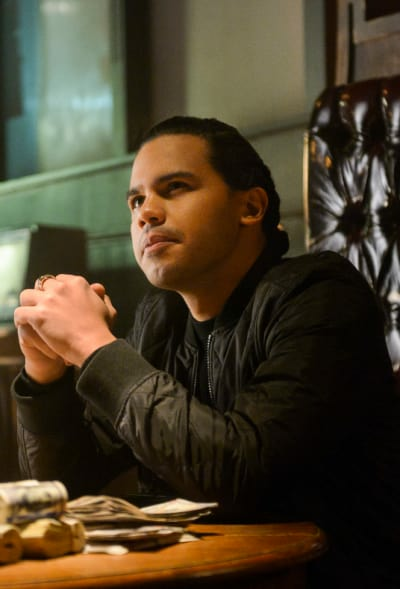 I had a hunch the black-suited Superman who confronted Barry and Oliver at the end of Arrow Season 7 Episode 9 was Deegan, and I was pleased that my assumptions were proven right almost immediately. 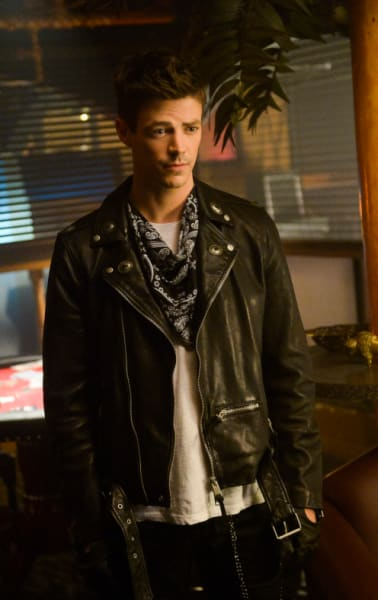 If The Flash, Elseworlds Part One was Freaky Friday/Quantum Leap, Supergirl was that time you had spirit week in school and had to dress up for Opposites Day. Everything was the opposite of what it really is in reality. Oliver and Barry were criminals known as the Trigger Twins, Superman was dark, Cisco was a drug boss who referred to himself as Mr. Ramon, and Jimmy Olsen was his muscle and Superman's worst enemy. While Kara's heart-to-heart with Alex was necessary to help her escape imprisonment, it was a level-10 snoozefest. We get it; you're sisters who have an inter-dimensional sisterly bond. I appreciate the sentiment that these sisters will always find each other no matter on what Earth they are trapped, but when so much is at stake, I'm really not interested in rehashing all of Alex's wonderful qualities. Also, why would she just stand-up for Kara as "her sister" if she barely knew the woman in her reality? The writers attempted to include most of the characters in the crossover in some capacity, but it felt like they got cheated on screentime. J'onn and Brainy were only brought out at the very end when they could have been helping all along. Supergirl's presence was also lacking a bit in her own episode. At times, it felt more like the Oliver Queen show with Supergirl and Kara serving as backup. Despite not having their powers, Oliver and Barry managed pretty well before they found "bad" Cisco and vibed to Earth 38's Fortress of Solitude to get help from the real Superman. Superman was the only person who stood a chance at taking down the evil version of himself. I'm going to rave about Tyler Hoechilin for a brief moment because he is superhero material. From his looks to the way he carries that crest to the wide emotional range he displays in his acting, he's superb and is largely responsible for the crossover being such a success. I can't say I feel any type of way about Lois Lane, though. I'm indifferent and accepted her for Clark's sake. While it doesn't seem like The CW is entertaining the idea of a Superman spinoff at this point since Clark gave the reigns over to Kara, I want more of his story, especially on the heels of a baby announcement, the move to Argo, and a proposal! Maybe it was supposed to serve as closure to Superman's storyline for the time being, but instead, I wanted to dive deeper into their relationship and how his role as a hero would be affected now that he had everything to lose. Seriously, Hoechilin adds a certain level of entertainment to the whole production. When The Flash kicked off with a tribute to The WB's Smallville and Supergirl ended back on the farm, I really hoped that maybe The CW would reboot it in a way that made sense within the worlds we've come to know. In an attempt to restore reality, Superman saw that Supergirl and The Flash would die trying to slow die the speed of time long enough for him to get the Book of Destiny. Deegan's power trip was eventually squandered when Oliver made a plea to The Monitor to spare Kara and The Flash because they were the "goodness" and "hope" the world needed. But in order for The Monitor to grant such a request and change their destiny, he had to provide The Monitor with a way to balance it. What deal did he cut? The Monitor also made an ominous comment that "changing the story comes at a cost." 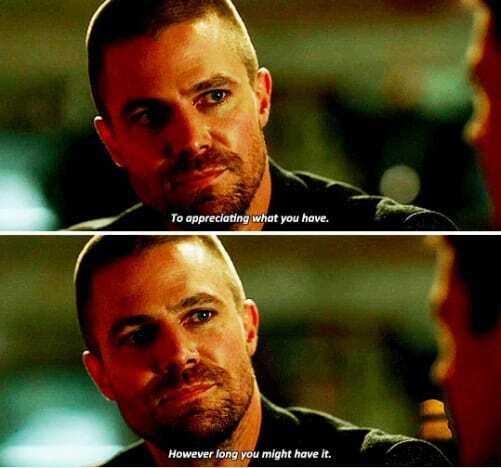 As Oliver and Barry celebrated their victory, Oliver made a comment about appreciating what you have for however long you make it that was even more ominous than The Monitor's. Is he sacrificing himself? Or does he know about a destiny that Barry hasn't been privy to yet? Maybe he's alluding to Kara and The Flash's comic-book death in Crisis on Infinite Earths, the just-announced crossover coming in the fall of 2019. What if Oliver will die instead of Barry and Kara? What if that was the deal he made with Monitor? All I know is I squealed and then realized that the Arrowverse as we know it will never be the same. 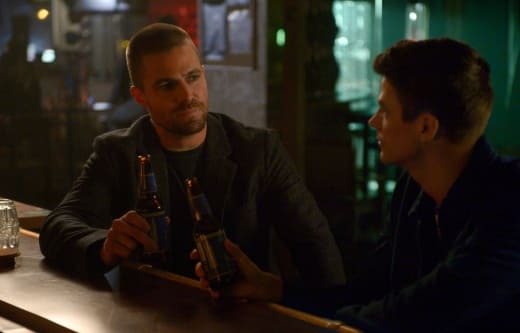 But one of the positives of the crossover is that Oliver is now on a path to becoming a better man and has learned to smile, at least occasionally. Hugging is still off-limits, though. Superman addressed Supergirl getting relinquished from her duties at the D.E.O. briefly and encouraged her to continue fighting crime regardless of whether or not she was a government employee. But it got me wondering ... why is Superman allowed to do as he pleases and isn't asked to give up his identity while Kara is literally being punished for trying to keep her cover to protect the people she loves? I also have to briefly address Batwoman. I want the series to get picked up for selfish reasons. Since I'm a Chicagoan, I was very pumped to see the superheroes walk the same streets that I walk every day. Chicago needs a superhero show! But I can't say Ruby Rose impressed me as Batwoman. A team-up between her and Supergirl would deliver plenty of mini-crossovers, not to mention, they'd make one badass team, but there was something about her that didn't live up to the hype. I also thought she was sorely underused during the crossover. If she wasn't around, our superheroes wouldn't have had any trouble handling things. I am not knocking the series yet because The CW still has enough time to make it right. But I think they overshadowed themselves by making Elseworlds not only a launchpad for Batwoman but also for the next crossover. You better believe that the upcoming crossover is the crisis for which The Monitor was trying to preparing them. Could the "something darker and more powerful" be Deegan's new ally in Arkham? Crossovers always bring so much joy because it's fun to see all of the different characters who don't get to work with each other frequently unite. It's the time when we get the strongest versions of each character putting their best foot forward as a cohesive unit. Sometimes, there's a lot to unpack, but it's definitely a deserving holiday gift for fans. Make sure you watch Supergirl online before episodes pick back up again! 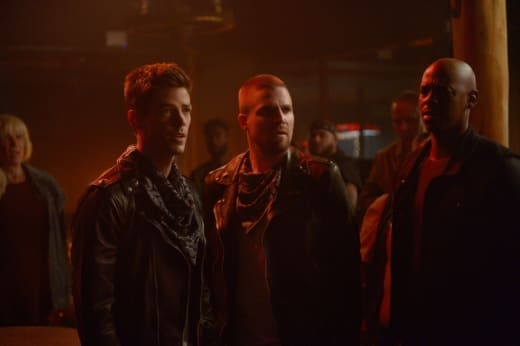 Even though Oliver didn't seem interested in reuniting on a more frequent basis, I wouldn't mind seeing them all get together to fight a common enemy more often. I could not stop laughing at Barry Allen's attempt at puking, his comment on Kara's cousin, "it's just one word 'Superman,'" or his exasperated, "I just came from there," when they had to go back to the Fortress of Solitude. I really enjoyed Barry and Oliver's back and forth banter. They seem to have a stronger bond now that they understand what it's like to walk, or run, in each other's shoes. Superman assuming Cisco was Kara was probably the funniest moment in the whole crossover. You just never know these days. Where did Lois get the hammer? What did you think of the crossover overall? 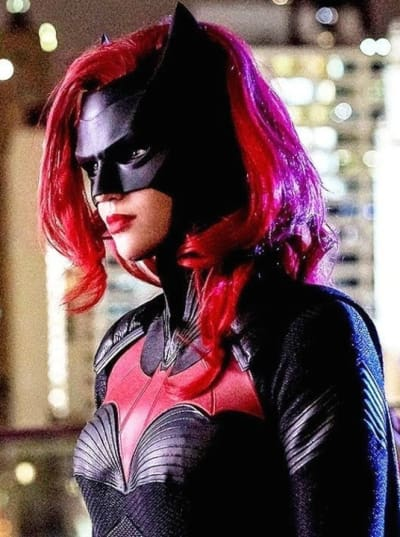 Are you excited for Batwoman? Are you pumped for next year's big crossover?